Buttermilk invites you to celebrate National Fudge Day on Sat 16th June! Cornish fudge manufacturer Buttermilk Fudge is celebrating National Fudge Day on Saturday, 16th June and is inviting you to be a part of it! If you’re wondering why a national awareness day has been devoted to this confectionery, it’s to raise awareness of its heritage and to encourage people to have a little British-made treat. 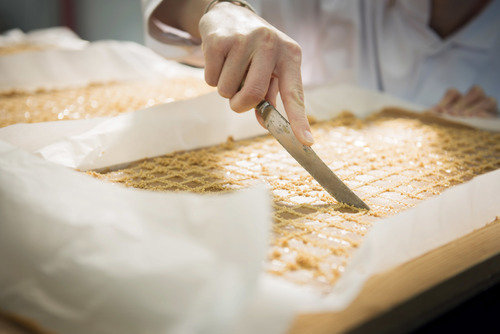 Buttermilk Fudge was started in 1964 in Padstow by two ladies called Elsie and Betty. It was taken over by the Goad family in the 1990s and is now run by second generation David and Tracy. From its beginnings in Padstow, which is one of the oldest fudge shops in Cornwall, there is a Buttermilk shop in Port Isaac which doubles as Mrs Tishell’s Pharmacy in ITV series Doc Martin, the range can be now found all over the country and even internationally. However, Buttermilk’s award-winning treats are still lovingly handmade in-house by craft confectioners using traditional methods. Now produced on the edge of Bodmin moor, the team can still be found using traditional copper pans over open flames, to blend ingredients and ensure the best texture and taste. The innovative team is always coming up with new flavours with Earl Grey Tea and Gin Fudge being the latest additions to the popular line-up, alongside traditional favourites clotted cream and butter tablet. Look out for opportunities to win Buttermilk in the week leading up to National Fudge Day including a competition to win a case of fudge bars at www.buttermilk.co.uk . There will be tasting across the county and the chance to win at the Royal Cornwall Show on 7th, 8th and 9th June and Taste London at Regent’s Park from 13th to 17th June. Follow Buttermilk on www.facebook.com/buttermilkconfectioneryco, www.twitter.com/buttermilkfudge and www.instagram.com/buttermilkconfections for more information. This press release was distributed by ResponseSource Press Release Wire on behalf of Margaret McDonnell (MAC PR) in the following categories: Women's Interest & Beauty, Food & Drink, Retail & Fashion, for more information visit https://pressreleasewire.responsesource.com/about.